Let me state at the outset that, in my view, to bring about rapid and sustainable growth of the Cuban economy, the flow of direct private capital investment would need to be re-established, and there would need to be a major modernization of the deteriorated capital stock of the country. Years of lack of maintenance and of refurbishing of existing plant and equipment, obsolete technologies, and lack of incentives to modernize have taken their toll and major investments will be needed. The current Cuban administration does not have the necessary financial resources to carry out such an effort, nor does it have access to external financing to do so. Cuba is heavily indebted and has little access to external credits other than those obtained from Venezuela and a few governments that are political allies and whose credits are conditioned on political commitments of doubtful duration. This has resulted in a concentration of Cuba’s international trade in just a few countries and a heavy reliance in the export of professional services, mainly to Venezuela, that have a very low multiplier effect on domestic activities. Moreover, the economy suffers from very low productivity and is hampered by the lack of appropriate incentives to the economic agents, distortions arising from a multiple currency system and excessive State intervention on economic decisions. Substantial structural reforms are needed to bring about a change in this situation. Under these conditions, the reestablishment of Cuba’s membership and participation in the activities of the main multilateral financial institutions would send an important signal to the rest of the world. It would indicate that Cuba is ready to adhere to a code of international behavior consistent with respect for international law, to respect the rights of its trading partners, and to make the necessary structural adjustments to bring about an increase in productivity of the economy. Such membership would be an important step to reestablish Cuba’s creditworthiness and its full participation in the world economic and financial system. Membership in the multilateral international financial institutions (known as IFIs) can play an important role in Cuba gaining access to financial resources and technical assistance to support economic reconstruction. It would also help normalize access to credit from international commercial banks, including access to financing for import transactions that currently have to be paid largely through cash payments. But more importantly, advice from the IFIs, and their participation in helping Cuba frame economic policies, can provide credibility to the efforts undertaken by the authorities and facilitate access to other sources of finance on competitive—and thus much cheaper—terms, making it possible to unlock financing from multilateral and bilateral lenders, as well as to facilitate the rescheduling or reduction of the outstanding external debt. Data provided by the Cuban authorities about its economy in the past have been questioned with respect to their transparency and accuracy. Membership and full participation in the activities of the IFIs and adherence to international standards, including independent evaluation of information, would go a long way to lend credibility to the data provided and make it possible for economic actors to make informed decisions. The initiative to join, or re-join, one or more of the IFIs must come from the country’s authorities, expressing a decision to create an appropriate environment to give investors assurances that their efforts will not go sour as a consequence of poor, erroneous, or contradictory public sector policies. While the IFIs can, and do, provide technical assistance in the design, planning, and implementation of an appropriate macroeconomic framework and of development projects, they cannot make the decisions for the national authorities, nor can they at times be fully aware of all the economic and political implications involved. The IFIs can help breach the gap between the time when the process of transformation of the economy commences and when private individuals have achieved sufficient confidence for the process of economic growth to be sustainable in a continuous manner. Clear and consistent policies are a very important ingredient in the restoration of confidence. While changes in legislation may be required in this context, the attitude of the authorities is extremely important. Such attitude is transmitted through various governmental actions, but especially through those that have to do with the resolution of conflicts and the impartial application of the rule of law. From an economic perspective, sound macroeconomic policies based on fiscal and monetary discipline, a market-based economy with prices being freely determined by demand and supply, liberalization of the domestic and external trade and payments system, and a legal recognition of the rights of private property would go a long way to restore the performance of the Cuban economy and the achievement of a sustainable growth path. In Cuba the activities of the IFIs have been demonized, painting them as a tool of foreign imperialism that would be imposed on the island. These fears are totally unfounded. Today, nearly all countries of the world belong to these organizations and benefit from membership. Both the International Monetary Fund (IMF) and the World Bank have played significant roles in assisting countries like Russia, Nicaragua and Viet Nam, among others, in their transition from centrally-planned to societies in which the free market plays a significant role. The results in Viet Nam have been particularly impressive, with a doubling of income per capita in just a few years since the liberalization process was begun. Cuba would particularly benefit, for example, from the IMF’s experience in gradually dismantling multiple exchange rates regimes, one of the problems currently faced by the Cuban economy that results in tremendous economic distortions and contributes to inefficiencies in the system. In addition to the IMF, there are other IFIs that could provide Cuba with financial resources to finance the needed investments, some of them on concessionary terms. 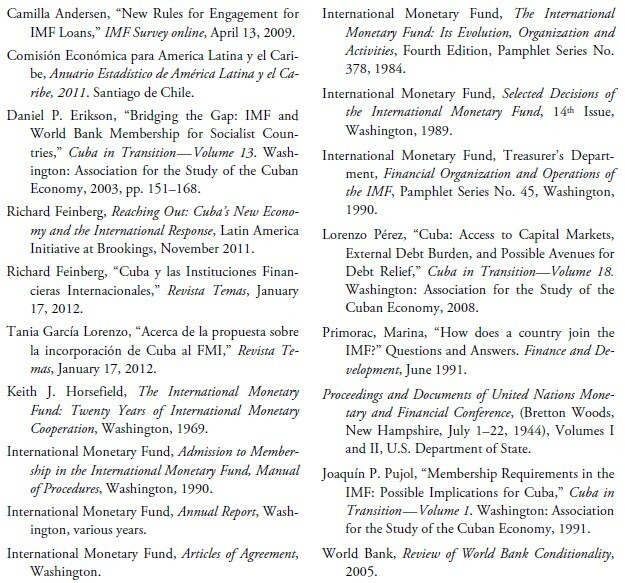 Two of those institutions are the World Bank and the Inter-American Development Bank (IDB).2 In this paper, I begin by identifying the main IFIs, providing some background on the nature of these organizations and the types of activities in which they engage, a short historical recount of Cuba ´s past relationship with them, and the requirements that Cuba would have to fulfill in order to join or rejoin the organization in order to gain access to financing and support. The paper also discusses the Paris Club, an institution that could play an important role in addressing Cuba’s external debt problems. According to its charter, the purpose of the IMF is to promote the expansion and balanced growth of international trade and to contribute to the promotion and maintenance of high levels of employment and real income in member countries and to the development of the productive resources of these countries. The Fund is thus concerned with the economic and financial problems of individual countries, as well as with the working of the international monetary system. Its activities are focused on promoting policies and strategies through which its members can achieve balance of payments viability on an individual basis and work together to ensure a stable international financial system and sustainable economic growth of the world economy. Aside from its responsibilities associated with overseeing the international monetary system to ensure its effective operation, the IMF exercises specific surveillance over the exchange rate policies and international payments practices of its members. It is the guardian of an agreed international code of conduct with respect to these policies. The procedures for surveillance adopted by the Fund are designed to identify and encourage the correction of inappropriate exchange rate policies, and each member upon joining the institution must accept the obligation to provide the information necessary for such surveillance. To facilitate the achievement of these goals, the members of the Fund have adopted a code of conduct in their relations with other countries. Countries that become members agree to give up some of their sovereignty over some decisions and to behave according to certain general principles. Among these is the establishment of a multilateral system of payments in which exchange restrictions on international transactions and payments are eventually eliminated. To assist member countries in abiding by the code of conduct, the Fund has available a pool of financial resources (currently US$845.4 billion, of which US$426 billion are presently uncommitted and usable3) that it can make available to members that have run into balance of payments difficulties, on a temporary basis while taking appropriate policies to resolve the underlying problems. The financial resources that may be available to any individual country can be fairly sizeable and are related to the quota (see below) that the country has contributed to the IMF. They can be made available provided: (1) there is a balance of payments need; and (2) the country is adopting appropriate policies to resolve the underlying problems. Use of the Fund’s resources is based on an equivalent and nondiscriminatory treatment of members, with due regard to their domestic, social and political objectives. Fund policies try to encourage members to have recourse to the Fund’s financial facilities at an early stage of their balance of payments problems. The financial assistance provided by the Fund is designed to allow members to correct their payments disequilibrium without having to resort to trade and payments restrictions that affect the well-being of other members. Disbursement of the IMF’s financial resources is made available during the course of the implementation of the adjustment program as the commitments made for policy action are implemented and the results materialize. To monitor progress under the program, targets are established along the period when the program is being implemented and disbursements occur as the achievement of these targets is confirmed. Each IMF member is assigned a quota that determines its financial and organizational relations with the institution. Quotas determine the member’s subscription to the Fund, its relative voting power, its maximum access to financing from the Fund, and its share in any Special Drawing Rights (SDR)4 allocations. The amount of a member’s quota is expressed in terms of SDRs and is equal to the subscription the member must pay to the Fund. Up to 25% of the subscription has to be paid in international reserve assets specified by the Fund (these are usually SDRs or convertible currencies usable in international transactions), and the remainder can be paid in the member’s own currency. This latter part usually is deposited in an account in the name of the Fund in the member’s central bank, or equivalent monetary institution. Each member has 250 basic votes plus one additional vote for each SDR100,000 of quota. A member’s voting power is important for two reasons. First, many of the principal policy and operational decisions of the Fund require certain majority of votes. (For example, an increase in members’ quotas needs an 85% majority, while the determination of charges on use of Fund credit requires a 70% majority.) Second, the voting power of a member has a bearing on the member’s representation in the Executive Board. Each of the five members with the largest quota, as well as each of the two members with the largest net creditor positions in the Fund over the two years preceding the regular biennial elections, is entitled to appoint an Executive Director. The remaining Directors are elected by groups or constituencies of members. The Articles of Agreement do not specify how a member’s quota should be determined. However, from the start of the Fund, quotas have been related to—although not strictly determined by—economic factors. Under the Articles, the Board of Governors is required to conduct a general review of quotas at intervals no longer than five years and to propose any adjustments that it may deem appropriate. Such reviews provide an opportunity to consider the adequacy of the Fund’s resources to fulfill its systemic responsibilities and to respond to the temporary balance of payments needs of its members, while maintaining the revolving character of its resources. The Board of Governors holds the power to admit new members to the IMF. However, it delegates the power of running the Fund on a daily basis to the Executive Board. When a country applies for membership, relevant macroeconomic data on its economy are collected, and a quota range is calculated. Data are then compared with those of existing members of comparable economic size and characteristics, and an initial quota or quota range is proposed by the Fund staff. This quota can be expected to be within the same range as the quotas of members the Fund considers to be in a comparable situation. The other terms of membership, such as the proportion of subscription to be paid in reserve assets, are set so as not to discriminate between applicants and existing members in similar circumstances. In the past some new members that did not have available sufficient international reserves in convertible currencies were able to temporarily borrow such reserves from friendly countries and, upon acceding to the Fund, the new member was able to draw down on the reserve tranche6 at no cost and virtually without conditionality so that it could repay the loan. A member is not eligible to use the Fund’s resources until it has paid its subscription in full. Likewise, a member’s quota cannot be increased until it has consented to the increase and paid the subscription in full. These requirements ensure that the Fund’s paidup capital equals its authorized capital, and there is therefore no component of “capital on call,” as is the case of some domestic financial institutions or even some international development banks. Cuba participated in the Bretton Woods Conference that resulted in the establishment of the IMF and the World Bank, and was one of the original members of the IMF. It left these organizations in 1964 partly because of the unwillingness of the Castro government to behave according to the code of conduct established in the Articles of Agreement concerning its obligations to allow international transactions free of restrictions and to share with the Fund information about its balance of payments and international transactions. At the time Cuba left the IMF, it had some outstanding financial obligations to the Fund but these were eventually settled. When Cuba originally joined the Fund (March 14, 1946), it was assigned a quota of US$50 million. Other countries being assigned a similar quota at the time were New Zealand, Norway, and Chile; meanwhile, Greece’s quota was set at US$40 million and Egypt’s at US$45 million.7 Cuba accepted the obligations of full convertibility of its currency under Article VIII of the Articles of Agreement in December 1953 but since it withdrew from membership in the Fund, on April 2, 1964, the Cuban peso has not been freely convertible. Access to Fund resources under the various Fund lending windows or facilities are usually specified in terms of member’s quotas. For example, the limits on access to Fund resources under stand-by or extended arrangements are currently 110% of quota on an annual basis, or 440% of quota on a cumulative basis (the latter defined net of outstanding obligations). This means that if Cuba, for example, had a quota of US$200 million and negotiated an extended arrangement with the IMF, it may be able to draw as much as US$880 million from the Fund over a three year period in support of an adjustment program The size of the financial arrangement is dictated by the balance of payments need of the country at that time. Nicaragua is among the countries that has benefitted from an extended arrangement from the IMF in support of its economic policies, as have also other Latin American countries. The approval of an extended arrangement with the IMF has allowed these countries to gain access to additional financial support from the World Bank and other international sources of financing amounting to several times the amounts available under the extended arrangement. To apply for membership to the Fund, the applicant country must be in control of its own foreign affairs, and both willing and able to meet the obligations of membership contained in the Articles of Agreement. Under those obligations, a member must conduct its exchange rate policy and related economic and financial policies in accordance with the Articles and provide requested economic and financial information to the Fund. A member must also pay a subscription—its quota. Although member countries do not have to adopt a market-type economic system to qualify for membership, nor do they need to adhere to a particular exchange rate regime, they are expected to pay regard in their foreign exchange policies to the objectives of the IMF and to take steps toward lifting any existing exchange restrictions as soon as possible. The Executive Board’s decision to consider an application and subsequently submit it to the Board of Governors depends on whether it is considered that the country can meet the obligations of membership; in that connection an applicant must have sufficient political support from the membership at large. Therefore, potential applicants tend to explore carefully the likely response of various important member countries and groups of countries before formally submitting an application. While no single member can block the acceptance of a new member, the Fund is an institution where many times decisions are made by consensus and the opposition of even one important member can derail an application by a new country.9 The actual timing of the acceptance of the application thus may hinge on domestic political and economic events and the perception among existing members of the willingness of the applicant country to adopt appropriate policies. In practice, an aspiring candidate needs to have one or more sponsoring members who are prepared to actively lobby the members of the Executive Board to ensure a positive response to an application for membership. Brazil has publicly called for Cuba to join the IMF and other IFIs and could play the role of Cuba’s sponsor. Once an application has been received, the IMF sends a fact-finding mission to the country to collect the necessary data for quota calculations and to prepare documentation on the economic and financial system of the country, its history and current policies. 10 At the same time, the mission informs the country about the IMF’s rules and policies, as well as about the financial, legal, and procedural steps of membership. The World Bank may also participate in such a mission, and it will use the quota arrived at by the IMF to determine the prospective member’s capital subscription for the Bank. Following the approval of the membership by the Executive Board, the country must enact the necessary legislation to enable it to become a signatory to the Articles of Agreement of the IMF. Under Article IV of the IMF’s Articles of Agreement, the IMF holds bilateral discussions with members, usually every year. A staff team visits the country, collects economic and financial information, and discusses with officials the country’s economic developments and policies. On return to headquarters, the staff prepares a report, which forms the basis for discussion by the Executive Board. At the conclusion of the discussion, the Managing Director, as Chairman of the Board, summarizes the views of Executive Directors, and this summary is transmitted to the country’s authorities. Membership in the IMF would bring Cuba back into the mainstream of international economic and financial activities and could potentially give it access to substantial financial resources if it was prepared to adopt appropriate policies to redress its balance of payments problems. It would also give Cuba access to important technical assistance and make it possible to benefit from access to the information that is exchanged through the forum of the Fund about the general world economy and the economic policies of other IMF members. In addition, membership in the IMF would have a catalytic role to attract other financial resources. Membership in the IMF is a pre-condition to joining the World Bank and its organizations and gain access to their resources. Moreover, having a program supported by the Fund significantly facilitates renegotiation of outstanding external debt with the members of the Paris Club (see below), as well as access to other sources of international credits to support investment and trade activities on competitive terms. The international financial community generally considers an IMF approval of a program a prerequisite for unlocking a whole range of financing by other multilateral and bilateral lenders, and for the rescheduling or reduction of official or private debt. The World Bank Group in fact involves several institutions. First, the Bank itself (formally known as the International Bank for Reconstruction and Development, IBRD), which can give loans directly to the government of member countries, or with government guarantees. Second, the International Finance Corporation (IFC), which provides financial support for private investors without government guarantees. Third, the International Development Association (IDA), which provides assistance on concessionary terms to the poorest developing countries. Fourth, the Multilateral Investment Guarantee Agency (MIGA), which helps encourage foreign investment in developing countries by providing guarantees to foreign investors against losses caused by noncommercial risks, advices governments on the design and implementation of policies, programs and procedures related to foreign investments, and sponsors a dialogue between the international business community and hosts governments on investments issues. And fifth, the International Center for Settlement of Investment Disputes (ICSID), which advices developing countries on how to attract and keep direct foreign investment. As in the case of the IMF, Cuba was a charter member of the World Bank but left the organization in November 1960, when the Che Guevara became the president of the Cuban Central Bank. To rejoin the World Bank, Cuba would have to meet the normal requirements of the Bank Group. A key requirement is that only members of the IMF may become members of the World Bank. Once the Fund determines the initial quota and the Executive Board of the IMF approves membership in the Fund, the initial subscription to the Bank’s capital is determined linked to the Fund quota. The Board of Governors of the Bank votes on the terms and conditions of membership once the Executive Directors of the Bank have approved the management recommendation to accept the request for membership. Cuba may classify as a “middle-income country” for purposes of World Bank lending, but it would be hard to see the World Bank or other bilateral international lenders being willing to lend considerable sums in support of an economic transition in Cuba without an IMF program. It must lend for productive purposes and must stimulate economic growth in the developing countries where it lends. It must pay due regard to the prospect of repayment. Loans are made to a government or must be guaranteed by a government. The use of loans cannot be restricted to purchases in any one particular member country. The Bank’s decision to lend must be based on economic considerations alone. Bank operations consist mainly of two kinds of lending: adjustment loans and project loans. About a quarter of the Bank’s lending is for adjustment. Adjustment loans help countries tackle macroeconomic difficulties, usually manifested in rising inflation and current or projected balance of payments problems. They are intended to support the transition of an economy to a new, sustainable and poverty-reducing growth path and are often undertaken in conjunction with an IMF-supported stabilization program. Typical adjustment policies involve reallocating and reducing public spending, opening an economy up to external or domestic competition, freeing prices to allow them to reflect economic values, improving government delivery of infrastructure and social services, and developing the institutions required of a well-functioning market economy, notably a sound financial system. Adjustment loans tend to emphasize private sector development as an instrument for promoting equitable and sustainable growth. Project lending can provide support to development both through direct resource transfers and through the backing given to policy, legal, and regulatory reforms that strengthen the competitiveness of the economy. These loans are normally for agriculture, infrastructure projects, education and health. The Bank’s Articles of Agreement do not preclude the Bank from lending to private enterprises, but require government guarantees on principal and interest payments. The Bank keeps track of the external public debt of member countries and the availability of this data would be of assistance in any renegotiation of Cuba’s external debt with the Paris Club and other possible grantors and/or lenders. The IFC plays a complementary role to the operations of the Bank, with the Bank providing an improved environment for the private sector to prosper and the IFC directly investing in, and lending to, the private sector. Many of the loans of the Bank are channeled through local financial intermediaries, while those of the IFC are given directly to the private sector. About a quarter of the Bank’s lending is for adjustment. These loans help countries tackle macroeconomic difficulties, usually manifested in rising inflation and current or projected balance of payments problems. Adjustment loans are intended to support the transition of an economy to a new, sustainable and poverty-reducing growth path and are often undertaken in conjunction with an IMF-supported stabilization program. MIGA’s activities take the form of investment guarantees against the risks of currency transfers, expropriation, war and civil disturbances, and breach of contracts by the host government. Established in 1960, IDA aims to reduce poverty by providing loans (called “credits”) and grants for programs that boost economic growth, reduce inequalities, and improve people’s living conditions in the poorest developing countries. IDA lends money on concessional terms. This means that IDA charges little or no interest and repayments are stretched over 25 to 40 years, including a 5– to 10– year grace period. It is the single largest source of donor funds for basic social services in these countries. The ICSID provides facilities for the settlement—by conciliation or arbitration—of investment disputes between foreign investors and their host countries. The IDB is the oldest and largest of the regional multilateral development institutions and it is today the principal source of external public financing for most Latin American countries. Created in 1959, its purpose is to support the economic and financial development of Latin America and the Caribbean. The Bank uses its own capital supplied by its member countries and channels resources obtained from international markets and other bilateral sources. It also provides technical assistance for preparation of its programs and projects, and promotes their co-financing by other sources. The Inter-American Investment Corporation, which is part of the IDB Group, makes capital investments and provides loans and loan guarantees to small-and-medium-sized businesses in Latin America and the Caribbean. A Cuban delegation participated in the negotiations that led to the establishment of the IDB in December 1959, but Cuba did not become a member of the organization. The original charter foresaw that Cuba would contribute about 4% of the capital of the IDB. The IDB Charter contains one stipulation for membership that has been the cause of some confusion in the Cuba case: “Membership shall be open to other members of the Organization of American States…” (Article II, Section 1(b)). In 1962 the OAS voted “to exclude the Government of Cuba from its participation in the inter-American system.” At the 2009 OAS General Assembly in San Pedro Sula, Honduras, the ministers of foreign affairs of the region declared that the 1962 resolution excluding Cuba “ceases to have effect…” Questions remain as to the conditions that will apply to allowing the “full participation” of Cuba in the OAS. The 2009 resolution stated that “the participation of the Republic of Cuba in the OAS will be the result of a process of dialogue initiated at the request of the Government of Cuba, and in accordance with the practices, purposes, and principles of the OAS.” Exactly what this might imply with regard to Cuba’s adherence to the principles of the 2001 Inter-American Democratic Charter and other democracy-related provisions of OAS decisions remains an issue for further diplomacy. To date, Cuba has displayed no interest in initiating such a dialogue. The IDB finances mostly projects, but it can provide up to 25% of its total lending in “rapid disbursements loans” which support reforms of entire sectors of national economies. These loans can also be used for operations designed to reduce external debt. In the past, about 38% of the IDB’s loans have been directed to projects designed to construct and improve physical infrastructure in energy, transportation and communications; 33% to projects in agriculture, fishing, industry, mining, tourism and the financing of micro enterprises; 18% to projects in public health, education, science and technology, and urban development; and 10% to finance planning, export financing, pre-investment expenditures and other types of loans. In Group B are Colombia, Chile, and Peru. The least developed countries are in group D— Bolivia, Ecuador, El Salvador, Guatemala, Guyana, Haiti, Honduras, Nicaragua, Paraguay, and the Dominican Republic. Cuba would probably be classified into the category D.
The Bank finances different proportion of the total cost of the projects depending on the country’s classification; ranging from 50% for countries in group A, to 80% in countries in group D. These proportions can be increased by up to 10 percentage points to the extent that at least 50% of the net benefits of the projects are received by low income groups. While countries in categories A and B are expected to be net contributors to the Fund for Special Operations, those in categories C and D are given priority in the access to concessional funds. In the case of countries in group D, the Bank may finance up to 90% of the cost of a project with concessional funds. Countries in groups C and D have received about one third of the total financing granted by the Bank, but 63% of the concessional funds. In addition to its own funds, and those it borrows in the market, the IDB also has available funds that have been turned over to the Bank for its administration in support of economic and social development by certain countries. These funds are generally available to finance low income individual projects on concessional terms. Only businesses in member countries may participate in the purchase of goods and services for Bank-financed projects. The Bank’s loan contracts stipulate that public sector borrowers procuring goods and services in excess of US$200,000 for construction must go through a process of open and competitive international bidding. Contracting of consulting firms also must be done through an open and competitive selection process. In the case of sector loan operations, procurements in excess of US$5 million are subject to a process of international public bidding. Although not a financial institution that lends money directly like the IFIs, for the sake of completeness I include the Paris Club in this paper as this institution plays an important role in assisting debtor countries in regularizing their situation vis-à-vis creditor countries and restore their access to commercial credits. The Paris Club (in French, Club de Paris) is an informal group of financial officials from 19 of some of the world’s largest economies, which provides financial services such as war funding, debt restructuring, debt relief, and debt cancellation to indebted countries and their creditors. Debtors are often recommended by the IMF after alternative means have failed. The main purpose of the Paris Club in providing debt rescheduling is to give the debtor countries cash relief in support of their economic programs to help resolve their international payments problems. Paris Club creditors provide debt treatment to debtor countries in the form of rescheduling, which is debt relief by postponement or, in the case of concessional rescheduling, reduction in debt service obligations during a defined period (flow treatment) or as of a set date (stock treatment). Such rescheduling are aimed at realigning the debt service profile taking into account the country’s capacity to repay, and they have normally provided the debtor countries with substantial relief. As debtor countries undertake reforms to stabilize and restore their macroeconomic and financial situation, Paris Club creditors provide an appropriate debt treatment. The Paris Club is the main forum where representatives of the main creditor countries get together to consider proposals for rescheduling bilateral debt of debtor countries. It meets every six weeks at the French Ministry of the Economy, Finance, and Industry in Paris. It is chaired by a senior official of the French Treasury, currently the Director General of the Treasury. The club grew out of crisis talks held in Paris in 1956 between Argentina and its creditors. Its principles and procedures were codified at the end of the 1970s in the context of the North-South Dialogue. In addition there is a debt owed to the former Soviet Union for the provision of arms, oil, and other imports before the collapse of the Soviet Empire, which was never repaid and might become an issue for discussion if there was a new Paris Club negotiation. The actual estimate of this debt in current terms depends on the exchange rate used for conversion and it has been estimated as high as the equivalent of US$28 billion. Cuba has had several negotiations with the Paris Club where the members of the Club agreed to reschedule debt owed to them but which the Cuban government did not honor; as a consequence, the Paris Club has not agreed to consider a new re-scheduling and credit remains closed to Cuba from many of the countries members of the Club. Cuba’s negotiations with an ad hoc group of creditors failed in April 2001, and Cuba has not renewed official negotiations with the Paris Club since, and the credit-insurance agencies of many of those countries had suspended their guarantees. Some countries which are members of the Paris Club have agreed to engage in bilateral negotiations with the Cuban government to restructure Cuba’s debt to them; however the bulk of the defaulted debt remains unscheduled. Starting in 2009, Cuba stopped honoring external payments in a whole range of obligations, including payments for imports and profits remittances, and at one point blocked the transfer of foreign exchange deposits held by foreign companies (which amounted to over one billion dollars). Most creditors were only given the choice between giving up their claim and their assets or to restructure the conditions as directed by Cuba. Throughout 2010 Cuba started to gradually release the frozen assets and tried to settle or renegotiate overdue external obligations due to suppliers. In December 2010 Cuba engaged in a renegotiation with China, one of its major creditors, and China agreed to postpone for 10 years the start of payments on an unspecified amount of the outstanding debt. Cuba also has been negotiating on a case by case basis with various countries, and both Germany and Japan have resumed coverage for short term commercial credits. Should there be a re-incorporation of Cuba to membership in the IMF and other IFIs, and should Cuba adopt an economic adjustment program supported by the IMF, negotiations with the Paris Club could be promptly resumed and substantial relief obtained, together with a re-opening of the credit lines by other members of the Club. At present, Cuba is extremely dependent on a very few international trading partners. Five countries are the destination of 77% of Cuban exports, seven the suppliers of 73% of its imports, and 70% of the total foreign trade of Cuba is concentrated in six countries, with Venezuela alone accounting for 37% of Cuba’s exports and 40% of imports. Moreover, Cuba has no access to international credits other that those arising from bilateral political negotiations. Cuba clearly needs to change this dependency on such a small number of countries and to widen the sources and financing of its foreign trade. Such a step would contribute to improve the likelihood of a prompt recuperation of economic activity on a much sounder basis. Having available stable sources of international financing on competitive terms for the process of investment and to meet domestic supplies needs of intermediate and consumer goods can significantly help the achievement of the goals of a sustainable economic growth and an improvement if the standard of living of its citizens. Cuba, in its recent past, has experienced the consequences of extreme reliance on one source for its trade and financial support with the demise of the Soviet Union and now faces a similar risk with its dependence on Venezuela. The authorities must take this in consideration in planning their next moves. The main issue with the possible re-integration of Cuba to the international financial system is the willingness on the part of the Cuban authorities to change the kind of economic policies it has been implementing and obtaining the political support of the other countries to be able to become active members of the IFIs and be able to reap the benefits of membership. The process of re-integration would not necessarily be a very long one, as can be seen from the experience of the former Soviet republics. International investors are deterred by risks related to the lack of liquidity, the absence of investment protection by a sound legal system, and the limited availability of reliable information. Liberalization of the exchange and trade system would be an important step to regain investors’ confidence, as would be the freedom to remit dividends and repatriate capital. Commercial lenders and investors in general, attach significant value to the IFIs’ knowledge and capacity for policy and project appraisal, and draw significant comfort from the co-financing instruments of these institutions. This gives the resources of the IFIs an important leverage effect in attracting financial capital to member countries that implement appropriate macroeconomic policies. The seal of approval of the IFIs, and in particular of the IMF, can usually be translated into an increase in the financial resources available to a country from all sources. Active participation in the IFIs and adherence to the code of conduct proclaimed by these institutions would help in the process of re-establishing access by Cuba to international capital markets and contribute to catalyze much needed private investment to Cuba. 1. The views expressed in this paper are those of the author and not of any of the institutions mentioned in this document. 2. Other international institutions of which Cuba is not currently a member which may be considered are The Caribbean Development Bank and the Banco Latinoamericano de Comercio Exterior (BLADEX). 3. Besides the quota-based resources, the International Monetary Fund (IMF) has a line of credit with 26 IMF members for up to US$600 billion under the so-called New Arrangements to Borrow (NAB) that can be drawn upon to deal with a global or regional systemic problem. 4. Special drawing rights (SDRs) are supplementary foreign exchange reserve assets defined and maintained by the IMF. Not a currency, SDRs instead represent a claim to currency held by IMF member countries for which they may be exchanged. As they can only be exchanged for Euros, Japanese yen, pounds sterling, or US dollars, SDRs may actually represent a potential claim on IMF member countries’ non-gold foreign exchange reserve assets, which are usually held in those currencies. Being the unit of account for the IMF has long been the main function of the SDR. 5. Cuba does not publish data about its international reserves and in the recent past it has not expressed an interest in joining the IFIs, partly because membership would entail an obligation to disclose substantial information about its economy and foreign obligations and would expose its economic policies to international scrutiny. 6. The “reserve tranche” corresponds to the first 25% of the quota of a member country and it is the portion that the country contributed in a convertible currency. 7. Currently, the quotas of these countries are: New Zealand, US$894 million; Norway, US$1,884 million; Chile, US$856 million; Greece, US$1,101 million, and Egypt, US$943 million. 8. The UNDP reports Cuban GDP per capita (on a purchasing power parity basis) at $5,747. This is well below the income levels achieved by other Latin American countries: Chile, $13,651; Uruguay, $13,808; Costa Rica, $10,870. Cuba’s GDP per capita is also well below that of the two largest Latin American countries, Mexico ($13,971) and Brazil ($10,607). 9. The United States has the largest quota in the Fund, with 16.75 percent of the voting power. While this is not enough to block an application for membership by Cuba—as only a simple majority of votes is sufficient to approve the admission of a new member— current U.S. legislation mandates its Executive Director to oppose the admission of Cuba unless a number of criteria are met and to withhold future U.S. contributions to any organization of which the U.S. is a member if Cuba is admitted without first having met the conditions established in the U.S. legislation. This injunction would also apply to membership in the World Bank and the Inter-American Development Bank. In practice the Executive Boards of these institutions would hesitate to take a decision in the face of a strong objection by its major shareholder. This means that some political agreement between Cuba and the U.S. would have to precede admission of Cuba to these organizations. 10. Without reliable and timely data, the IMF staff cannot asses a country’s economy performance and its compliance with agreed targets under a program. 11. Moody’s rates Cuba’s debt “Caa1,” meaning poor quality and very high credit risk. Unable to service or to renegotiate many of its outstanding debts, Cuba is denied access to international capital markets (beyond secured short-term suppliers’ credits), compounding the shortages of critical imports and investment capital. Absent recourse to normal commercial credits, Cuba must seek government-togovernment official financing for its priority development projects. 12. European Union, Cuba Country Strategy Paper and National Indicative Programme for the Period 2011–2013, March 2010. Table 1. Cuba’s Paris Club Creditors as of 2008 Creditor (Country) Medium and Long Term Debt (in billion US$) Creditor (Country) Medium and Long Term Debt (in billion US$) 1. Venezuela 11.367 15. United Kingdom 0.342 2. Spain 3.200 16. Vietnam 0.297 3. China 3.170 17. Czech Republic 0.278 4. Japan 2.775 18. Belgium 0.231 5. Argentina 1.967 19. Netherlands 0.149 6. France 1.856 20. Austria 0.095 7. Romania 1.236 21. Canada 0.094 8. Russia (post-Soviet) 1.149 22. Trinidad & Tobago 0.030 9. Iran 0.656 23. Uruguay 0.030 10. Panama 0.425 24. Sweden 0.026 11. Germany 0.411 25. Denmark 0.014 12. Mexico 0.400 26. Portugal 0.008 13. Italy 0.371 27. Switzerland 0.003 14. Brazil 0.350 28. Undisclosed 0.751 Source: European Union, Cuba Country Strategy Paper and National Indicative Programme for the Period 2011–2013, March 2010. 13. Paris Club’s claims against Cuba (outstanding debt) as of 31 December 2011, excluding late interest, is reported as USD$250 million in the form of Official Development Assistance and USD$30,256 million in Non-Official Development Assistance, for a total of USD$30,506 million. See http://www.clubdeparis.org.